In politics they say a week is a long time, and in the currency markets it is a day, with Wednesday’s dramatic breakout from the pennant pattern for the euro dollar promptly being reversed a day later with an equally dramatic fall which was triggered by equity markets falling (with the London Stock Exchange ceasing to work at all) following a statement about restructuring Dubai World’s debt. 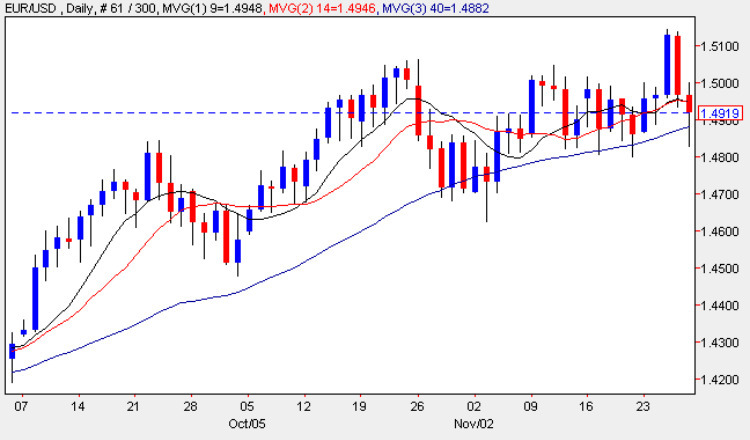 On a day characterized by thin trading volumes owing to the Thanksgiving Holiday this was sufficient to drive investors into the comparative safe haven status of the US leaving us with a bearish engulfing signal on the daily euro dollar chart which is in stark contrast to the previous day of a bullish breakout from the well developed consolidation pattern. The key now, of course ,is whether platform now waiting below will provide the necessary support to yesterday’s sharp move lower, and any breach could signal a retest of this deep area of price consolidation and indeed in this morning’s trading we are already seeing the euro dollar making a spirited fightback climbing back through the 40 day moving average and attempting to re-base at 1.50 & this afternoon’s US session will determine the extent to which risk appetite has fled the markets. The only items of fundamental news on the economic calendar today for the euro dollar have been in Europe with German Import Prices coming at at 0.5% and Consumer Confidence at -17. What is one of the best retail forex trading platforms? In my view it is Metatrader 4. Advanced, powerful & intuitive it now comes with ECN execution, so you can happily scalp away without broker or dealer intervention. Just download your free demo copy of MT4 by following this link – download metatrader free – and get started today. Don’t forget to follow my daily posts for updates and analysis of the forex markets to help you with your forex trading – so good luck and good trading.